Former Massachusetts Gov. William Weld waged a tough but notably civil election battle with Sen. John Kerry. CNN's Judy Woodruff on John Kerry's journey to the nomination. CNN's Bill Schneider on Kerry's challenge: defining his image. BOSTON, Massachusetts (CNN) -- Former Massachusetts Gov. William Weld, the last Republican to wage a close election battle with Sen. John Kerry, portrayed his political rival Thursday as a wily debater prone at times to "analysis paralysis." The socially moderate, fiscally conservative and popular governor challenged Kerry's U.S. Senate seat in 1996, engaging in a spirited -- and notably civil -- campaign. Now an investment banker living in New York, Weld returned to his home state this week at the Republican National Committee's request. In Boston, Weld said Kerry tends to see "so many sides of an issue that it's difficult to make a decision and get on with it -- which is something in government sometimes you simply have to do." "If you ponder endlessly on almost every issue, you're going to lose ground to delay." Kerry's vote to authorize military force in Iraq in late 2002 only to later vote against an $87 billion appropriation for the war effort typifies his indecisiveness, Weld said. Kerry supported an alternate bill that would have funded the appropriation by eliminating a tax cut for high-income Americans. That bill was defeated. Weld predicted that a Kerry presidency would mean higher taxes, a "more intrusive government role" in people's lives and restrictions on the right to bear arms. Kerry voted in the Senate for both the Brady Bill and the assault weapons ban. He has also said that he would cut taxes for the middle class, and roll back Bush's tax cuts for the wealthiest Americans only. 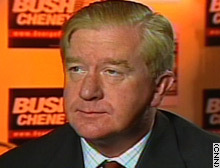 Weld said that he supported President Bush but would not likely campaign much on his behalf. "I overlapped with Governor Bush as a governor four years, saw a lot of him," Weld said. "I'm one of those relatively few people who knows both candidates well." But the two-term governor also complimented Kerry, the two having mutually agreed to spending caps and holding eight highly praised televised debates during the 1996 Senate race. Kerry ended up beating Weld by 7 percentage points. "He ran a good race -- that was a fair and equal fight," said Weld, adding, though, that President Clinton's 33-point victory over GOP nominee Bob Dole in heavily Democratic Massachusetts that year hardly helped his cause. Weld extolled Kerry's debate skills, saying he has "the speed of a welterweight." "He can bob, he can weave, he can move around. It's very hard to land a blow on him in a debate," Weld said. "He's what I would call a grand master at the art of changing the subject. That's his chosen metier: the one-liner." Although Weld described debating Kerry as an uphill fight, he advised Bush to be himself when he butts heads with the senator later this year. "I think Bush is so likable, so warm, so obviously tough-minded and clear-headed, that I think that comes through," Weld said. "Even if perhaps somebody else is such a skillful debater, they can win the debate on points, they can eventually lose on sympathy."